Reaching a captive audience has long been a top priority for advertisers. After all, what better way is there to promote a product than right before a movie, when ticket buyers are settling in for two hours, or on a subway placard facing seat-bound commuters? Yet, a recent plan to sell advertising space on visitation video monitors at a Florida jail has some wondering whether such marketing efforts have gone too far. 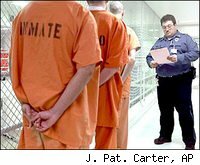 The Charlotte County, Fla. Sheriff's Office hopes to bring in about $77,000 a year by selling ad space to the likes of attorneys or other companies providing services that might appeal to inmates or their visitors, making it perhaps the first jailhouse advertising program in the U.S., according to WINKnews.com, a web site for the television channel WINK in Southwest Florida. The reason for plan? Lt. Norm Wilson was facing a tighter budget and wanted to come up with ways to fund prisoner programs, the news site says. Wilson didn't return Daily Finance's call seeking comment. Like the Charlotte County Sheriff's office, cash-strapped public schools are also resorting to similar advertising programs, says Josh Golin, associate director of the Boston-based Campaign for a Commercial-Free Childhood. Some schools are offering naming rights or advertising space on school buses, he says. "There is an ethical issue with advertising to anybody -- whether it's a child or an adult -- when there's no way to opt out of it," Golin says. "Our primary defense against advertising is our ability to turn it off, and that's really being lost." Golin believes marketers are exploiting the fact that entities like schools are facing such tight budget constraints and are desperate for new sources of funding. Take a company called MilkMedia. The company sells advertisements for toys and action characters on the side of milk cartons to elementary through high school students. According to its Website, the program reaches more than 40 million students each day through 98,000 schools. And then there are school buses. The Paradise Valley School Bus Advertising Program sells ads on 130 buses in the North Scottsdale and North East Phoenix areas of Arizona, according to its web site. The pitch to advertisers? Buying an ad on one bus creates 52,000 daily impressions while helping to fund local public schools. While assisting public school systems is a noble goal, they aren't appropriate places for marketers, says CCFC's Golin. "Schools are supposed to be a place where everything they're exposed to is in their best interest, not for someone else's best interest," he adds. "Freedom from advertising is something that people have a right to."